The weather has been chilly and I have been home sick for the past few days. So this means I’ll need to drink fluids, take meds, and eat yummy soup! 🙂 I’m sick but that doesn’t mean I still can’t whip up a pot of homemade soup! I love French Onion soup.. my favorites have been at Vie de France and Doughboys Café & Bakery. Hot soup with onions, bread & melted cheese.. mmmmm! In a large skillet over medium low heat, melt butter. Sautee onion until golden in color, about 8 minutes. In a medium saucepan, combine beef broth and sautéed onion; bring to a boil. Reduce heat, cover, and simmer for 25 to 30 minutes. Meanwhile, toast French bread on both sides under broiler; sprinkle each slice evenly with cheeses; broil just until cheese is bubbly. 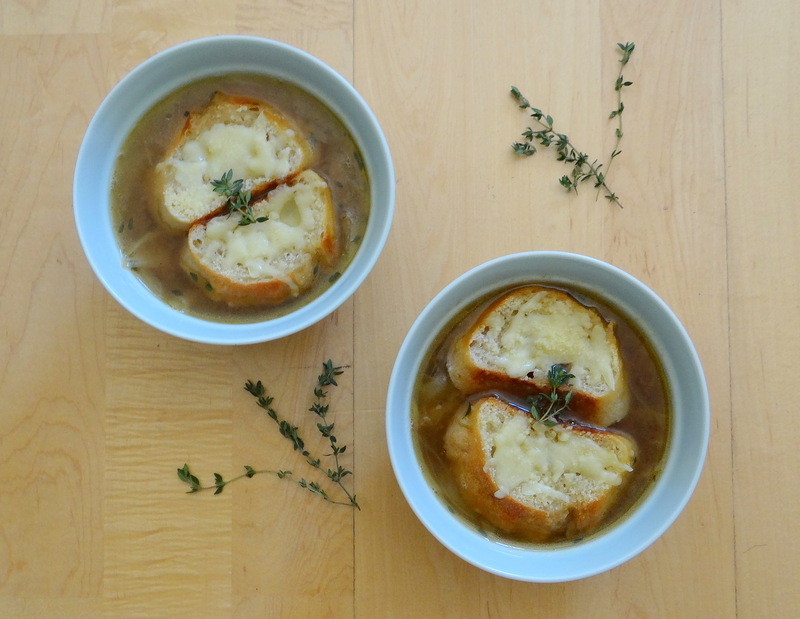 Pour French onion soup into 4 individual soup bowls; float a slice of toasted French bread, cheese side up, on each bowl of French onion soup. French onion soup serves 4.